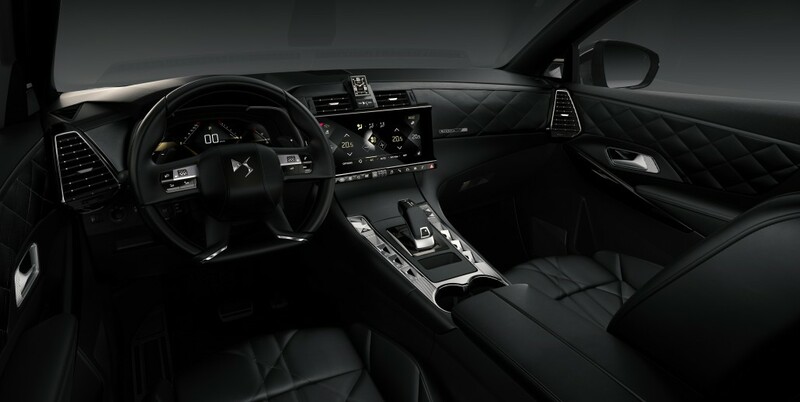 It may not have the panache of the original 1950s model, but when it comes to luxury interiors and onboard tech this new DS 7 Crossback has it all. 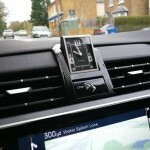 Chris Price reviews an SUV with a certain je ne sais quoi! It’s funny how as technology marches on apace, many of us yearn for the supposed ‘good old days’ when things were supposedly much more fun. Driving is a case in point. In the 1960s and 1970s roads were so much quieter and the only on board tech you had to contend with was a dodgy AM/FM radio or, if you were really flash, a stereo cassette deck. No wonder then that car manufacturers are looking back to a golden age of driving when everything seemed so much more exciting (though in my experience of British Leyland cars the main excitement was wondering if the car would actually start, let alone make it to your destination without breaking down). Heritage British brand MG is currently trying to reinvent itself for the modern age under Chinese ownership without much success in my opinion (I recently tested the MG GS and was hugely disappointed) while Groupe PSA which owns Peugeot, Citroën, and now Opel and Vauxhall brands in Europe, has spun off a new company named after its most iconic car, the Citroën DS (pictured below). For younger readers not familiar with the Citroën DS it’s perhaps worth considering just how iconic this luxury car was at the time. 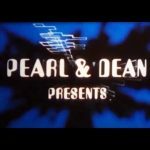 Launched at the Paris Motor Show in 1955, it was an instant success – capturing people’s imaginations just like Tesla does today with its electric cars – and achieving record sales on launch. Famed for its space-age styling as well as its novel hydropneumatic suspension system, it offered a much smoother ride on France’s famously pot holed roads than its competitors. 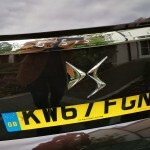 Even today the DS’s styling means it is extremely difficult to clamp without removing its rear bumper! But if nostalgic drivers were hoping for a return of striking exterior designs like the DS offered, then forget it. 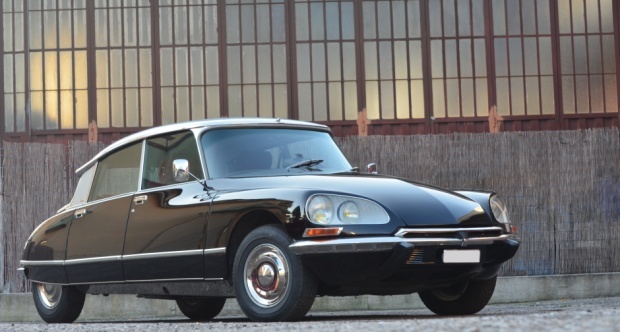 European health and safety legislation, coupled with increasing human body sizes (both outwards and upwards), mean that we won’t see the likes of the original DS rolling off production lines any time soon. Even though the original DS was quite a long car, leg room wasn’t that great, certainly not big enough to accommodate current northern European frames. However what Groupe PSA is trying to do with the DS brand is at least evoke some of the heritage of the 1950s original car and create something that is synonymous with French luxury in a similar way to brands such as Louis Vuitton, Chanel and Yves Saint Laurent. 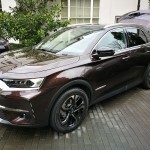 Not that these qualities are immediately evident from the latest model in the DS line up, the DS 7 Crossback, which Shiny Shiny was invited to test out driving round Ascot’s very beautiful Coworth Park and surrounding areas. 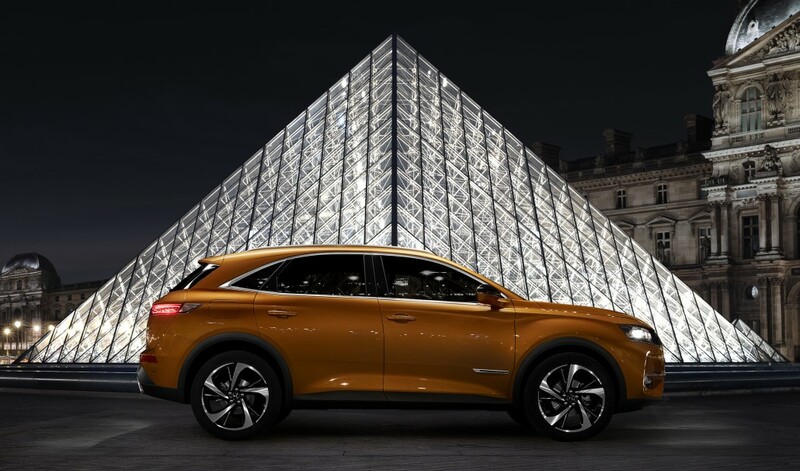 Following on from smaller models (the DS3, DS4, DS5), the DS7 Crossback is an SUV (Sports Utility Vehicle), designed to compete with the likes of the Audi Q5, even with the prestigious Range Rover Evoque. It’s also the first proper stand-alone model of the new DS range. Prices start at a fairly reasonable £28,000 on the road for the entry level manual model (the Blue HDi 130), rising to £43,000 for the Ultra Prestige PureTech 225 and Blue HDi 180 automatic models. A £50,000 electric version (the E-TENSE PHEV 4 x 4) will be available from mid-2019. 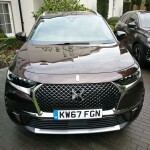 And while from the outside there isn’t perhaps too much to distinguish the DS7 Crossback from its competition, apart from the headlights and some unusual colours (including the brown anthracite model which we tested, pictured below), it’s on the inside that this DS model really starts to get interesting. One feature, in particular, which is unusual on a model at this price point is night vision. Using an infra-red camera located in the front grille, the DS7 is able to identify objects, including animals and pedestrians, on the road at a distance of 100m. All you have to do is set the large screen behind the steering wheel into night vision mode and it’s possible to see everything around you (in black and white) even if it’s pitch black. For example, if someone, or more likely something, comes close to the car at night it’s highlighted on the screen with a red line and a warning sound is emitted so that the driver can take appropriate action. Unfortunately driving around urban the streets of Windsor on a Tuesday night only revealed joggers on the pavement and the occasional person crossing the road – see YouTube video above. However, for those driving on remote country roads late at night I can imagine this feature could prove invaluable. Nor does the safety technology stop there. 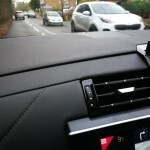 DS Connected Pilot works in conjunction car’s adaptive cruise control to regulate the car’s speed according to the surrounding traffic and works from standstill to 112miles per hour (obviously not allowed on UK roads). 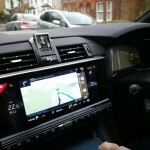 Other features include DS Park Pilot to help you parallel park on the road and in a bay and DS Driver Attention which can sense if you are about to nod off behind the wheel. Basically it works by using a camera above the steering wheel to monitor head movement and to check whether your eyes are open! If the system detects any risk then it will send you a warning to take a break. When it comes to in car entertainment, DS is clearly hoping to distinguish itself from some of the competition. 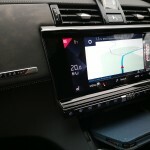 On board are a number of luxury entertainment features, including a 12.3inch digital cluster behind the steering wheel and a large 12inch HD touchscreen panel in the centre of the car. Here you can connect various entertainment sources via Bluetooth, USB etc (of course DAB audio is included as standard). Complementing video is a sound system from Focal, one of France’s leading hi-fi specialists. Fourteen Focal Electra speakers are positioned around the cabin and I must admit I was pleasantly surprised by the audio quality which sounded really clear whether I was listening to speech on Radio Four or deep bass tones on Radio One Extra! However, best of all is the massage feature which can be set individually for the front two seats. I particularly liked the ‘Cat’s Paw’ mode which gives your back a good pummelling although it might not suit everyone, especially if you are driving. 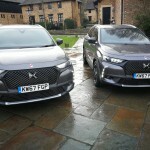 I mentioned earlier that at first glance there’s little to distinguish the DS 7 Crossback from other SUVs, at least in terms of size and shape. Look closer though and you do notice some rather nice exterior features, particularly the car’s lighting. Like the original DS, the new DS features rather innovative lighting called DS Active LED Vision. This comprises three bejewelled LED units which spin around 180 degrees to face outwards when you unlock the car. 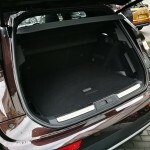 The three units can rotate up and down as well as side to side, and there are six lighting modes available, including parking, town, country, motorway, adverse and high beam. The tail-lights look good too, with LEDs illuminating a distinctive laser-engraved diamond pattern which helps to make this model stand out from the crowd of SUVs. Another tribute to the original DS comes in the form of suspension. 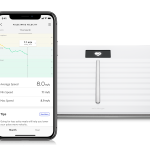 And while it’s not hydraulically sprung like the original, it features cameras that are capable of sensing a pothole or a speed bump in the road and adjusting the suspension accordingly. Not many other cars have a similar feature at this price point, although I must admit when we drove the DS 7 Crossback around Ascot we didn’t really feel much difference – perhaps we need to try it out in a more urban environment to really notice. Inside the car we see the same attention to detail as on the outside – probably even more so. These are a number of finishes to choose from, which DS rather pretentiously refers to as ‘interior ambiences’. 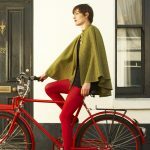 These include Bastille, Rivoli, Opera and Performance Line. As well as different coloured interior lighting to suit your mood, the DS 7 Crossback’s cabin features an unusual, decorative pearl-stitch top-stitching along the dashboard and door panels. There’s also a classy mix of leather and wood on display in addition to a very stylish clock (the B.R.M R180) which turns 180 degrees when the engine is started. It all feels very French and luxurious which I guess is the idea, just as the oversized speedometer in the Mini Cooper feels quintessentially British. 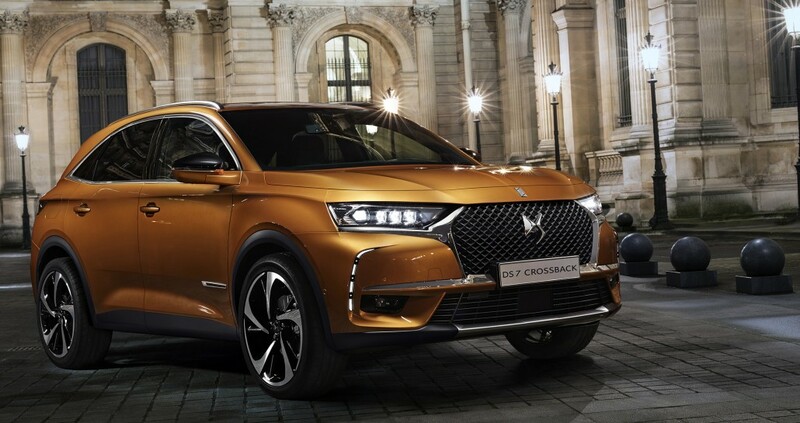 Although it’s very difficult to get overly excited by yet another SUV, the DS 7 Crossback is certainly an impressive car. OK it lacks the style of the original DS model but that’s to be expected in the modern age. We tested several models and although the entry level manual Blue HDi 130 manual model felt a little underpowered with only a 1.5 litre diesel engine (£28,000 on the road price), the same could not be said for the more expensive 1.6 litre petrol automatic or the 2 litre diesel automatic versions. Handling was generally pretty decent around country roads and of course there were more tech features on board than I knew what to do with! However, what really sets this model apart from others in the same category is the sumptuous interior. Rewind to the 1960s and put this model up against the original DS and I reckon that most people would choose this one, simply for the interior luxury and the Cat’s Paw massage chair of course! For more information on DS Automobiles, visit the DS Website www.dsautomobiles.co.uk. All DS products are available from DS Stores and DS Salons. DS also has a flagship store, DS WORLD PARIS and a DS URBAN STORE in the UK, located in the Westfield London shopping centre at White City.